A thriller about a kidnapped young woman who suddenly reappears at her family’s doorstep eight years after her late night abduction. Good as Gone distinguishes itself with a nuanced approach to these issues. Gentry has worked with survivors of domestic and sexual abuse, which may account for the sophisticated way she handles women's vulnerability to violence ... So much about this novel is fresh and insightful and decidedly not like every other thriller. It's a letdown, then, when the ending involves an action sequence at Houston's Waterwall Park. 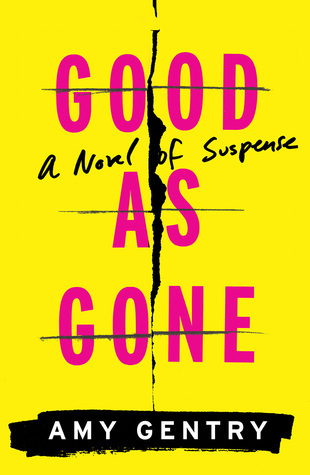 The scene feels formulaic ... That concession to genre aside, Good as Gone ranks as an outstanding debut, well worth reading. This is no mere Gone Girl wannabe. Gentry seems less interested in answering the question of whether this Julie Whitaker is the stolen child of the same name than she is in taking a longer, harder look at what makes up an identity in the first place ... If the central question of the novel is inescapably simple — Is this person Julie Whitaker or isn’t she? — there are only two possible answers. But the attendant riddle of identity is correspondingly complex. In the end, Gentry’s novel isn’t primarily about the version of the self that comes from a name and a family of origin; instead, it draws our attention to the self that’s forged from sheer survival, and from the clarifying call to vengeance. ...[a] smart, crisply written thriller ... In alternating chapters, the novel traces Anna’s anguished attempts to learn the truth and unwinds tales of teen girls on the run, on the streets, in group homes and foster homes — with the frequent common denominator of sexual abuse. The second strand is a familiar strain in recent fiction. The more propulsive narrative often belongs to Anna, a mother forced to confront failures she’s inherited and those of her own making. What did you think of Good as Gone?